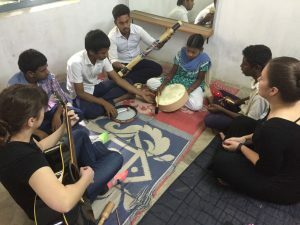 India Joy Giver Experience - Day 2 - Resounding Joy Inc.Resounding Joy Inc.
Today was our second day of clinical work in India, and it was an incredible experience to say the least. The morning began at the special needs school, and this was our second time at this site. I originally felt much more prepared than yesterday, since my partner, Eternity, and I planned out a set of interventions to use with the children, along with backup interventions to use if we had extra time. However, things hardly ever go to plan in the music therapy world, and that is something we all learn to be flexible with. We started the session at the school with the whole group of students, following the routine of interventions that we had done the previous day. It ran smoothly, and each of us had a part in leading the session. Once we split the group into three smaller groups, things became a bit more hectic, and the real learning experience began. Eternity and I started with the speech-language pathology group of students, which included older teenage kids and a girl who had a severe hearing impairment. This is something that we had not prepared for, and we immediately had to think quickly to come up with age-appropriate and population-appropriate interventions, which was challenging since neither one of us had much experience with this age group or population. Our program director, Annela Flores, came to our rescue and worked through some interventions with the group that were very effective with engaging the students. 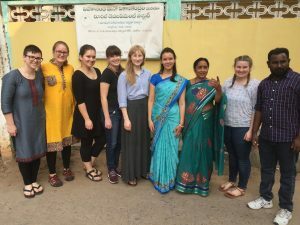 She utilized echo chanting, where she would chant a repetitive Telugu (the language spoken in this area of India) consonant or vowel, and have the students repeat the chant back. She also utilized bubbles to reinforce vowel sounds, and we did some follow-the-leader exercises with percussive instruments, pairing verbal sounds and syllables with the rhythms. I learned a ton from working with this group, and with Annela’s help, I feel much more prepared to work with this population in the future. Moving on to our second group of the day was very successful. We played “Old MacDonald,” and had the students verbalize animal names and vocalize the corresponding sounds. We also used an intervention focusing on matching the picture of a fruit to its name. A large group of typically developing students came in to watch the session, and were extremely supportive of the students, cheering them on whenever they achieved a goal. Our third and final group at the school was more difficult due to the students being so restless and distracted. After a long run of trial and error, we found that more active interventions engaged them the most and were successful with working toward goals focusing on motor function. After a delicious lunch provided by the school, we packed up the bus and left for our second clinical site of the day; the special needs home. The group consisted of about 15 children with varying diagnoses and ages. 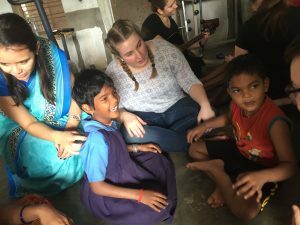 We began with a group session, and I was able to work closely with a boy who seemed to have an intellectual disability paired with cerebral palsy. We used proprioceptive squeezing along his arms and legs, and I helped him play egg shakers while moving them in different directions (i.e., up, down, to the side, etc.). He was able to eventually shake the shakers on his own with no physical prompt necessary, as well as make some consistent eye contact with me, which was exciting and rewarding to see. After finishing the group session, we split the children into smaller groups and worked on more individualized interventions. Eternity and I worked with a child who had very little to no motor control, nor verbal communication ability. We worked with him and his mother in order to teach her ways to soothe him, so she could continue these practices even after we were no longer present. 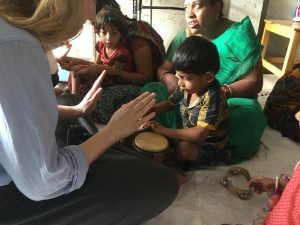 Although there was a challenge with the language barrier, we were able to successfully teach her about proprioceptive squeezing, as well as the impact she could make on calming him by singing, despite her own thoughts or negative opinions of her voice. We had her practice singing to him toward the end of the session, and his facial expression and body relaxed, which was a great sign. This entire trip has been an eye-opening, heartwarming experience thus far, and I can’t wait to see what the rest of our days have to offer!